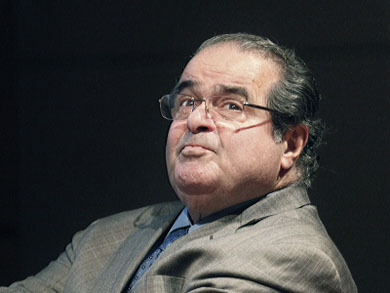 Justice Antonin Scalia, who recently came under fire for equating the Voting Rights Act to a racial entitlement. I first heard about this issue on NPR, but have since listened to so many arguments either for or against striking down the law that I decided to put my faith in Google to figure out what is really going on. I thought the Times gave a pretty solid overview of the history of the Voting Rights Act in their editorial following the Supreme Court’s hearing on it last Wednesday (February 27). SCOTUSblog also gives a strong summary of the legal questions surrounding the case. Shelby County argues that the South has changed and doesn’t need the law anymore. Minority voting registration, they point out, is up. Their point makes a lot of sense. Minority registration is up. Even in Shelby County, many of the barriers that once existed in order to curtail the black vote are no longer in play. Other groups, however, such as the NAACP Legal Defense Fund, insist on the act’s continued relevance, so I decided to actually read it in an effort to see for myself what protections it does (and does not) grant. A lot of the language focuses on ending prescriptions and impediments on the right to vote, which Congress was most concerned about when LBJ signed the act into law in 1965. The contentious part of the act, however, concerns the provisions of Section 5 stating that any changes in voting procedures have to be overseen by the federal government (preclearance) in states and “political subdivisions” with a history of voting discrimination. This includes any changes in voting requirements, polling sites, or district lines. The most recent version of the act allows jurisdictions to opt out if they can claim a clean record for 10 years, although Shelby County, the county bringing the case to the high court, does not qualify. As recently as 2008, the Justice Department struck down a redistricting plan that would have unseated the only African-American elected official in Calera, Alabama, a small city in Shelby County, about 30 miles south of Birmingham. In fact, a Reuters article from last June suggests that this lack of a clean record is the main reason the Court is considering the constitutionality of the Voting Rights Act. When conservative advocate Edward Blum came across the Justice Department’s action against Shelby County on the department’s website, he called Frank “Butch” Ellis, the lawyer for the county, and put him in contact with his own lawyer, the prominent D.C. attorney Burt Rein. Rein’s firm, in turn, brought Shelby County v. Holder all the way to the high court. Gerrymandering is nothing new, but proving political intent behind redistricting has, historically, been difficult in the courts. According to Emily Bazelon at Slate, the Voting Rights Act is one of the only legal impediments to gerrymandering insofar as it curtails redistricting schemes meant to disenfranchise minority voters. Congress suggests that the 12,000 pages of testimony it collected show the continued necessity of the Voting Rights Act. Chief Justice Roberts, on the other hand, contends that the formula for declaring which districts are covered by the act is based upon outmoded data from the 1970s. In the last decision on the Voting Rights Act (in which the Court dodged the major constitutional questions due to the plaintiff’s ten-year-plus clean record making it eligible to opt out of Section 5), a case also backed by Blum, Justice Roberts claimed that “things have changed in the South,” and that Congress should try to address contemporary realities. Ilya Shapiro from the Cato Institute argues that the courts employ ambiguous areas of jurisprudence when they use Section 5 to protect the ability of minority groups to elect their preferred officials. There is no justiciable definition, for example, constituting the “ability to elect.” He argues that Section 2 of the act provides enough protection for the 15th amendment, and is preferable over Section 5 because it provides a national standard. My initial reading of Section 2 was that it focused specifically on the ability to vote, although it also provides protection against racially discriminatory redistricting plans. Sherrilyn Ifill, the president of the NAACP Legal Defense Fund, says that there is no way to challenge every legal maneuver state and local municipalities might use to mitigate the minority vote. “The reality is without Section 5, you can’t keep up,” she said in her interview with NPR. Conventional wisdom suggests that there is a good chance the Court will rule the current coverage formula unconstitutional. Of course, Congress could just develop a new formula using current data, although proponents of the current formula aren’t hopeful, in general, given the partisan gridlock that has become the norm in Washington. This entry was posted in Uncategorized and tagged 15th Amendment, Civil Rights, Emily Bazelon, Ilya Shapiro, preclearance, Scotus, Section 2, Section 5, Shelby Count v. Holder, Slate, Supreme Court, Voting Rights Act of 1965. Bookmark the permalink.